I read Orson Scott Card&apos;s children&apos;s novel Ender&apos;s Game for the first time ever this summer. 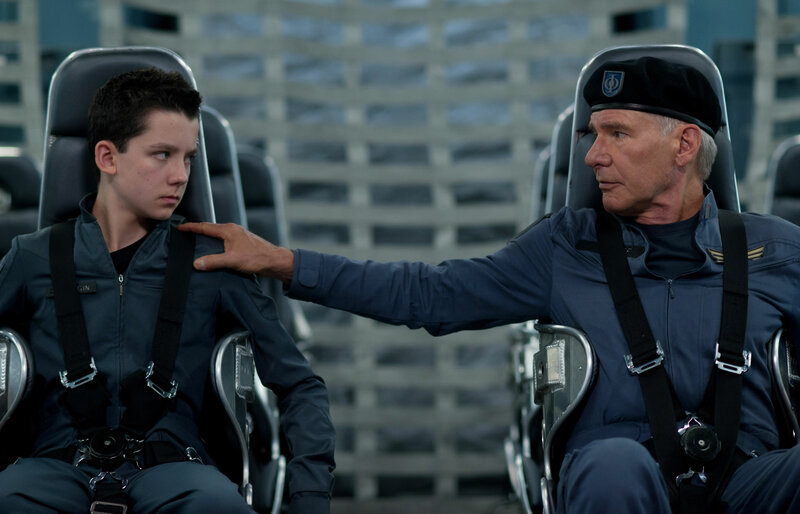 Ender&apos;s Game, which has been adapted into a movie starring Asa Butterfield and Harrison Ford that comes out today, is a science fiction book about a six-year-old named Ender Wiggin. Ender, who is a kind of military-tactics prodigy, is conscripted by the government of Earth as a trainee general in an ongoing war with a species of insectoid aliens. The book has courted some controversy for depicting and even encouraging some questionable behavior in kids — and for its author&apos;s politics. But why do we care so much about the moral content of kids&apos; books? Why don&apos;t we have the same conversations about adult fiction? Ender&apos;s Game was published in 1985, and so a lot of kids who grew up in the 90s have happy memories of it. The book features all kinds of things that a reader under the age of 13 would love: space battles, long zero-gravity acrobatic sequences, pre-adolescents who somehow have the privileges and responsibilities of adults. But reading it as an adult — in particular, reading it for the first time as an adult — is really weird. First of all, there&apos;s the hubbub around Orson Scott Card himself, who made some pretty damningly anti-gay remarks a while ago and also has a disconcerting range of quasi-libertarian, conspiracy-theory-inflected views about history and politics. Okay, fine — I wouldn&apos;t want to meet J.M. Barrie or A.A. Milne, either. I don&apos;t need the authors of children&apos;s books to be saints. Still — and I realize my life may not be worth much after I write this — it&apos;s hard not to keep seeing a lot of things in the book that seem offensive, wrong, or just creepy. The teacher-officer who recruits Ender explains that Battle School is mainly boys; girls "don&apos;t often pass the tests to get in. Too many centuries of evolution are working against them." (When in fact, the difference in physical strength between children by gender is pretty small — to say nothing of test scores.) The idea that might makes right is a constant preoccupation of Card&apos;s: Ender gets the better of bullies mainly by beating the living daylights out of them (and even killing one), although he feels deep remorse for it. At one point, Ender thinks of his psychopathic brother Peter: "Peter might be scum, but Peter had been right, always right; the power to cause pain is the only power that matters, the power to kill and destroy, because if you can&apos;t kill then you are always subject to those who can, and nothing and no one will ever save you." Stereotypes and epithets, too, poke out in weird places. Infelicitously, given Card&apos;s recent remarks, the aliens in the first book of the series are called "buggers." This wouldn&apos;t be so bad (Card later renamed them "Formics") if "buggerlover" weren&apos;t hurled as an insult so often. Nor are the slurs limited to aliens. One minor character introduces himself thus: "We doing OK, Ender Bender. I Rose de Nose, Jewboy extraordinaire, and you ain&apos;t nothing but a pinheaded pinprick of a goy. Don&apos;t you forget it." And despite having come from the imagination of a man who publicly reviles homosexuality, there are an awful lot of moments when the boys at the school are rather gratuitously described as running around naked for no particular reason. Doubtlessly, all of this stuff will be scrubbed from the movie adaptation. (At least, I hope it will be.) But I think it is noteworthy, and even a little odd, that we discuss the morality of children&apos;s literature with an intensity and passion that we rarely adopt in discussing adult fiction. Intelligent grown-ups who would go to the stake to defend the freedoms of speech and press are suddenly willing to turn into the household Stasi in order prevent their kids from being brainwashed by unsavory material. There are young parents who probably shudder to think of their kid reading Ender&apos;s Game at age eight, and I knew parents of friends growing up who wouldn&apos;t let them read His Dark Materials because the books might lead them out of the fold. The general theory behind this exceptional censoriousness is that children are especially impressionable, and if they read the wrong thing before they have a proper context, it might be far more damaging than if they read the same thing after their critical faculties have been more fully developed. Socrates makes this argument in book 3 of Plato&apos;s Republic: "The opinions [the young] absorb at that age are hard to erase and apt to become unalterable ... We should probably take the utmost care to insure that the first stories they hear about virtue are the best ones for them to hear." We moderns like to dismiss Socrates&apos; case against literature — or really, for the utter bowdlerization of literature — as silly. But when we make a case that kids should be kept away from a book like Ender&apos;s Game, we&apos;re basically hearkening back to Socrates&apos; argument. Still, maybe we should credit the sensibilities of youth with a little more resilience than some wary parents — and Socrates — would allow. Most of the people I&apos;ve known who read and liked Ender&apos;s Game when they were kids have not been irreparably warped on account of it. We all know people who have been steered down a certain course as teenagers by coming across The Fountainhead or Also Sprach Zarathustra at too young an age. But there&apos;s a moment before that — the time before the critical consciousness blinkingly awakens when one can read deeply affecting and polemically charged stories without having a word of it sink into your head for very long — which might be the sweetest moment in the life of a young reader. It&apos;s a short moment, and you wouldn&apos;t want to will yourself into such a state of obliviousness to the social and ethical messages of literature forever. But, in its place, that&apos;s the time when you can be enthralled by Ender&apos;s war, or Harry&apos;s, or Meg&apos;s, or Matthias&apos;s, or Will and Lyra&apos;s, while yourself enjoying a fleeting immunity from being unwittingly drafted by either side. The privilege of the young reader is that of being, however briefly, a noncombatant in such grown-up matters.